Big Bang Comics #4 was an All-Star issue of Big Bang in more ways than one. Cover dated September 1996 from Image Comics, this story was an homage to DC Comics’ Justice Society of America, the first super hero team, who had starred in All-Star Comics back in the 1940s. An all star team of Big Bang creators worked on this issue, along with top pros Terry Beatty (who provided the front cover), Rich Buckler and comics legend Mart Nodell. Our group of Golden Age heroes was the Knights of Justice, who had individually been introduced in issue #s 0, 1 and 2 of the Caliber Press mini-series. The KOJ team debuted in the 3rd issue, “The Criss-Cross Crisis.” While that story was meant to invoke the Silver Age Justice League/Justice Society crossovers of the 1960s, this issue of the ongoing series from Image Comics was the first appearance of the KOJ as a team in their own time period. (You can check out the entries for those issues in previous posts of this blog). 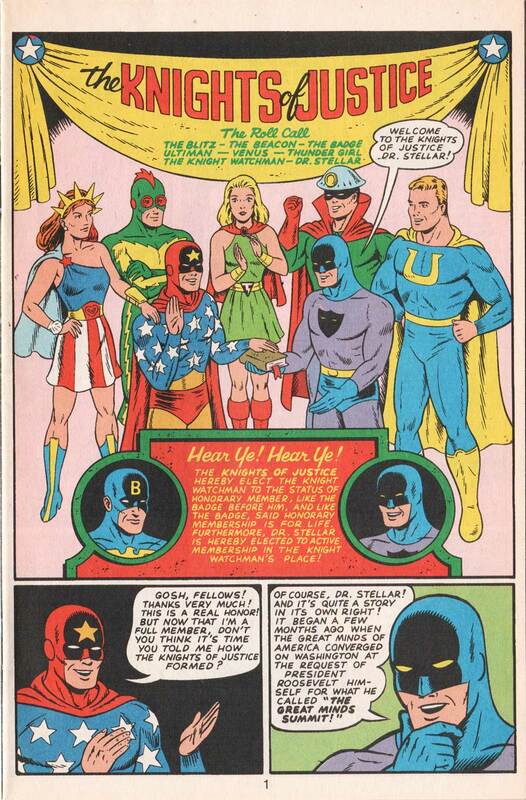 Like their inspiration, the JSA in All-Star Comics, each of the Knights of Justice starred in their own solo chapter, written and drawn by different creators, and the team itself only appeared together in the first and last segments. The Knights of Justice (in this issue) were Ultiman, Knight Watchman, Thunder Girl, Venus, the Blitz, the Beacon and the Badge. The impetus of the story has the KOJ convening to welcome Dr. Stellar as their newest member. He asks how the team was formed and each member obliges by narrating how they became involved. The wraparound segments that start and end the story were written by long-time Big Bang scribe Terrance Griep, Jr. He sets the table by introducing the tale of “The Great Minds Summit” in which President Roosevelt invited the greatest minds of America and her allies to Washington D.C. to help end World War 2. Terrance also scripted the first chapter starring the Blitz, who in his identity as a newsreel reporter was accompanying inventor Hank Fort to D.C. on the Super Chief. The train is attacked by Nazi spies, led by a General who is a combination of Adolph Hitler and Moe Howard of the Three Stooges. 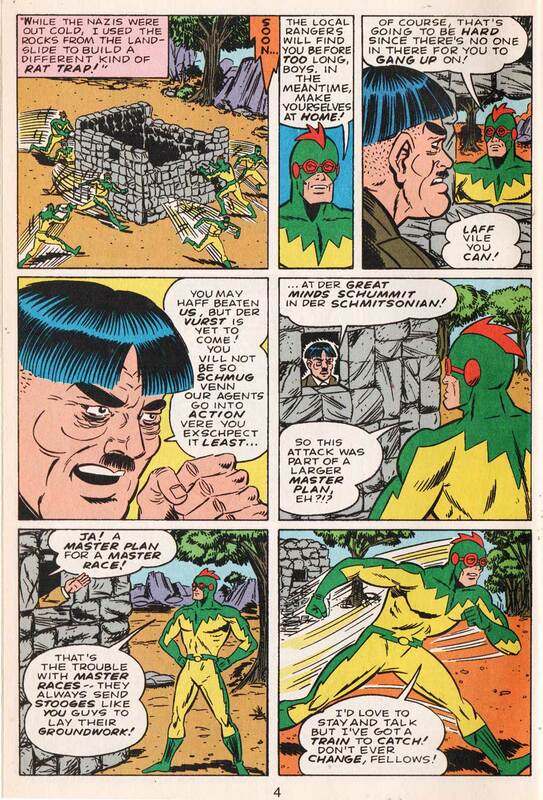 The Blitz stops the attack, builds a jail out of loose boulders and races off to get back on the train, all in three pages which were drawn by Big Bang co-creator Chris Ecker. Mr. Griep has gone on to write Scooby-Doo and various projects for DC Comics as well as Heroic Publishing, Alias Enterprises and others. He also wrestles professionally as the SpiderBaby. The Beacon chapter was written by Bud Hanzel (who had previously written the Beacon prose piece “The Razor’s Edge” in Caliber’s BB #1). 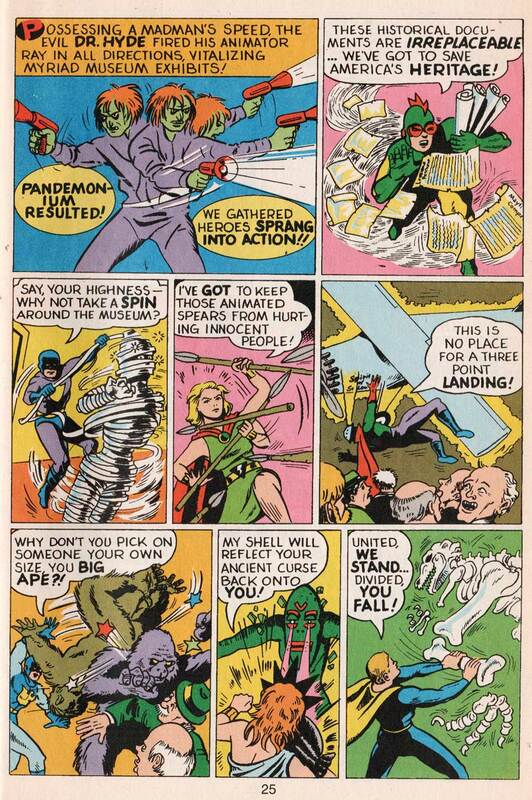 The art was provided by Mart Nodell, the then 80 year old creator of the Golden Age Green Lantern. Mart had also drawn a Beacon pin-up which appeared two issues earlier as the back cover to BB #2. Marty and his wife Carrie were regulars at Comic Cons back in those days and were a lot of fun. Carrie always referred to us and Big Bang as “The Bang,” which is where the title of this blog comes from. Both are sorely missed. Next up came the first of three chapters in a row written by me. 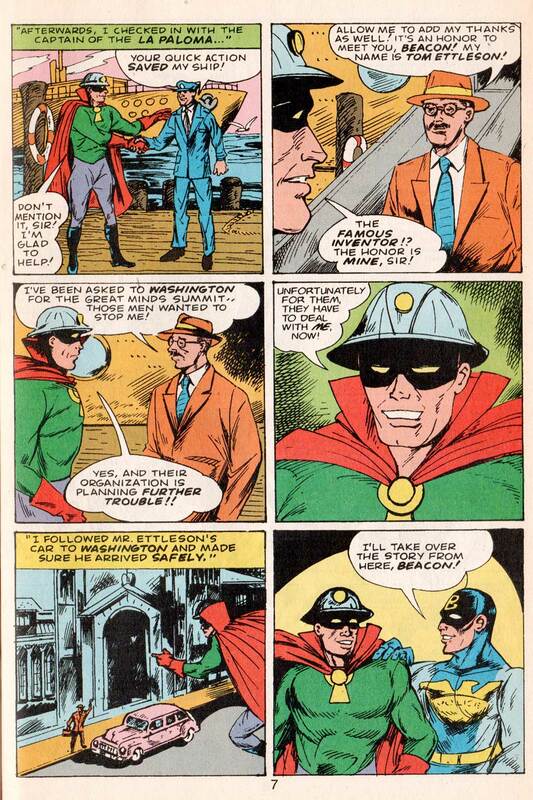 In it, the Badge foils the kidnapping of scientist Dr. Reinstein, who is taking his top-secret formula to Washington. At the end of the chapter, the Doc tells the Badge that America needs more heroes like him, and he’ll soon have lots of help if his formula is a success. This chapter was penciled by Mark Lewis and inked by Jim Brozman. Mark’s Simon & Kirby style stories always have been among my very favorites in Big Bang’s 30+ year history. 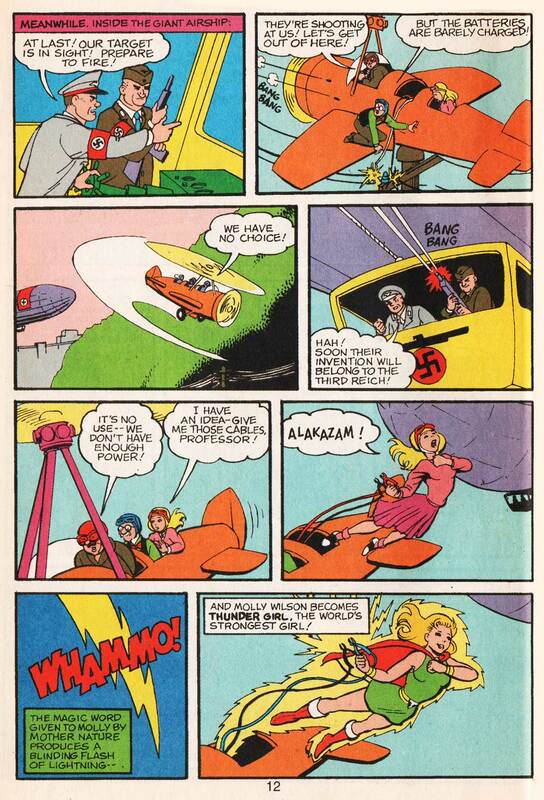 Thunder Girl shows up, thwarting a Nazi zeppelin that was trying to stop her friend Professor Eureka and his pal Dr. Igorski from reaching the Great Minds Summit. Bill Neville provided the art, admirably filling the big shoes of regular T-Girl artist Bill Fugate, who was sick at the time. The following chapter stars “the eerie twilight paladin known as the Knight Watchman.” Penciled by Rich Buckler, one of my all time favorites, and beautifully inked by Terry Beatty, it looks different than all the other Watchman stories we’ve ever done, yet authentic. What a blast! 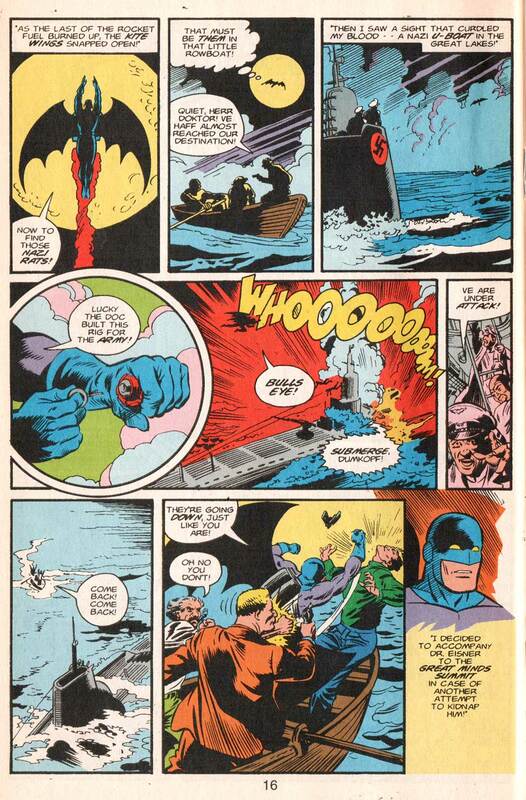 In three pages we see the Watchwagon, the very Batcavesque laboratory of Dr. Igor Eisner who provides many of the KW’s marvelous toys, KW in a jetpack turned batwing glider, and KW tossing a hand grenade at a Nazi submarine. Whew! 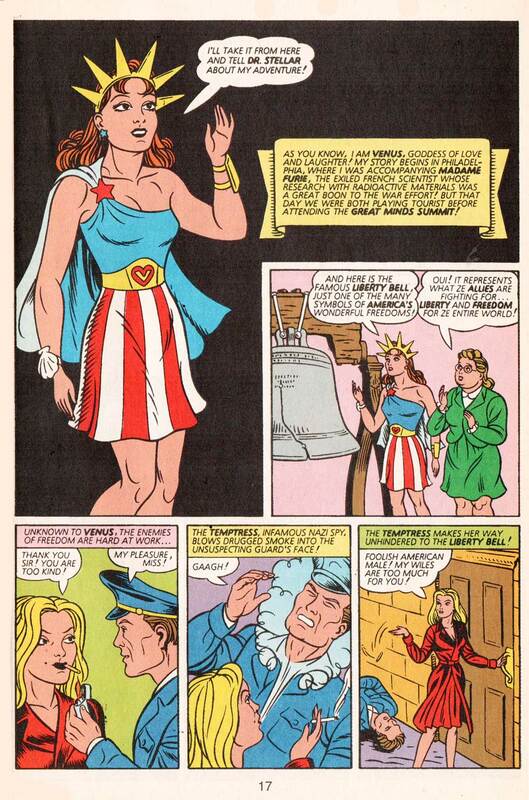 Ed DeGeorge wrote the Venus segment, in which the Goddess of Love and Laughter is bound to the Liberty Bell and later uses her flying horse Pegasus to rescue foreign scientist Madame Furie from a Nazi agent known as the Temptress. It was penciled by Stephanie Sanderson (now Heike) and inked by John Thompson with a gorgeous Harry G. Peter-inspired patina. John Thompson provided both pencils and inks on the Ultiman chapter, in which the Ultimate Human Being serves as bodyguard to Winston Churchill, who is in Washington D.C. for the Summit. There, Ultiman foils the plot of a weird green-skinned fiend who has turned the Washington Monument into a rocket aimed at the White House. 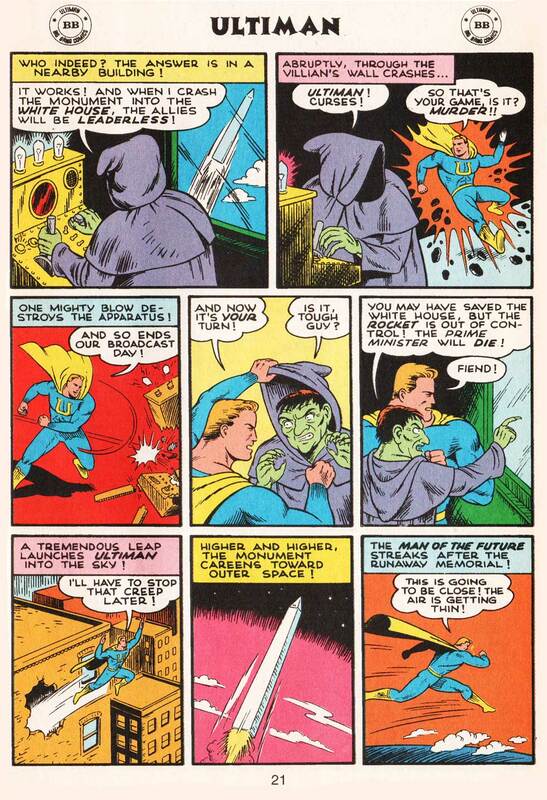 This leads to the final chapter, featuring art by Charles Smith, in which the green fiend is revealed to be scientist Dr. Henry Hyde. Bitter over not being invited to the Summit, he decided to derail it. Using a weapon he invented, an animator ray gun, Hyde brings the exhibits to life at the Smithsonian Institution, where the Summit is being held. Chaos ensues! The Knight Watchman battles a mummy. The Badge fights some stuffed gorillas. Ultiman takes on a T. Rex skeleton. 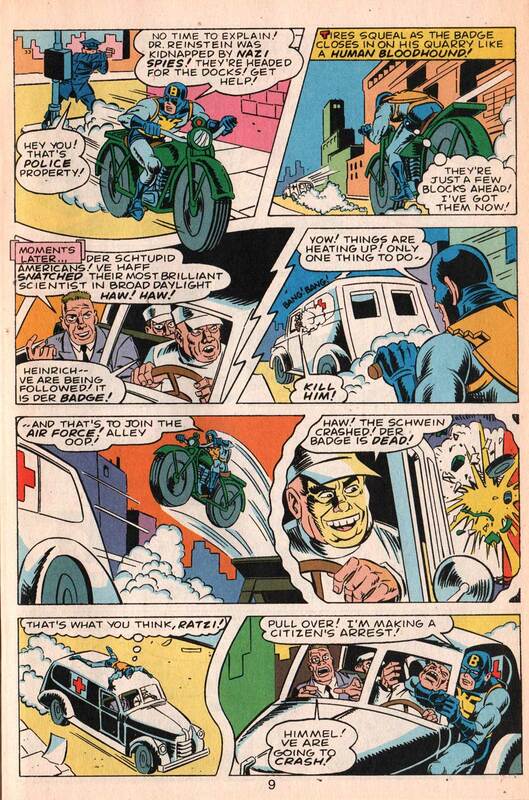 But Dr. Hyde pushes his weapon too far and it backfires, killing him. At that point, one of the other scientists discovers that Dr. Hyde’s invite had been stuck to his own invitation to the Great Minds Summit. FDR and Churchill suggest that the heroes team up for good, and the Knights of Justice were born!